I want my babyback babyback babyback babyback ribs!! Occasionally a recipe comes along that just has to be shared. Well, today is one of those days folks!! 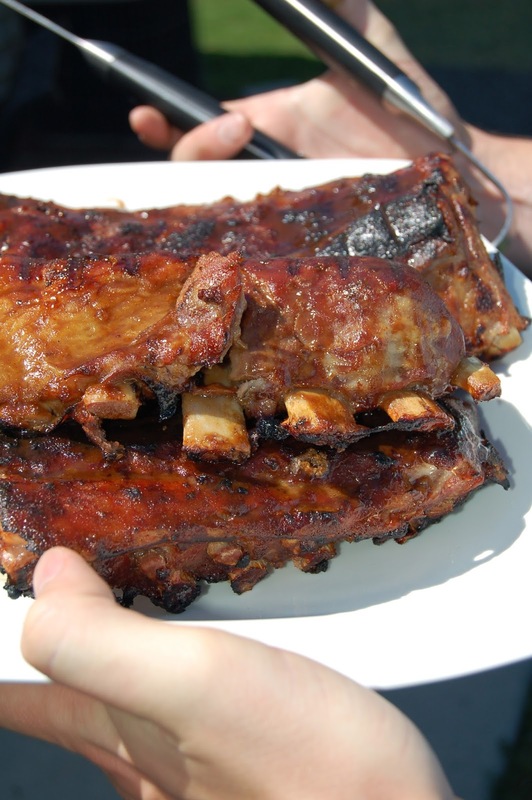 These are fall-off-the-bone, melt-in-your-mouth, juicy, meaty ribs ya'll! Ribs, a Southern tradition. A carnivorous art form. A slab of meat that takes time and attention for a successful outcome. The key is low and slow. Cook the meat on a low temperature and slowly. Then quickly finish them on the grill on medium-high heat to seal in the flavor and juices. I came across the technique in Real Simple magazine several years ago and have tweaked to perfection. The article was about the different preparation techniques for various cuts of ribs. Since I always get baby back ribs (pork), I decided to rip out that page and go from there. With Ryan's mad grilling skills and my fearless recipe testing, these ribs have become a family favorite! It was the perfect recipe to accompany the Hegele Fantasy Football kickoff this past weekend. There was major trash-talking and major finger-licking! My dad kept sneaking a bite even before they were slathered with sauce! I start with the rub. I use two different ones, depending on what flavor outcome we want - spicy or sweet. The sweet rub is more like the one I found in that magazine all those years ago, and it pairs very nicely with the Dijon Balsamic Barbecue sauce recipe below. However, my mom prefers to use my Blackening Rub instead since she likes a little kick. 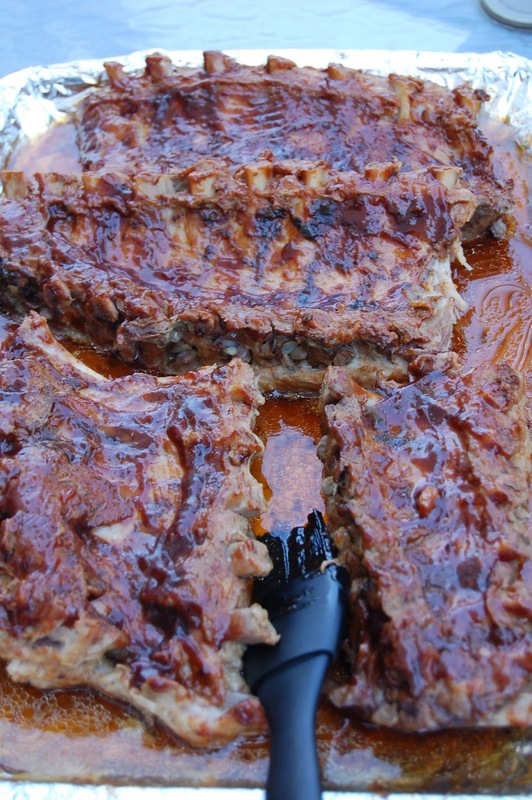 The blackening rub is really good with a mesquite-type barbecue sauce. However, we agreed that the best combination is my Blackening Rub and the Dijon Balsamic Barbecue sauce! Very important! But only added right at the end to finish on the grill. The sauce is what creates the crunchy outside of the rib meat, which seals in all the juices. There is always a big argument for what kind of sauce we should use because it is a very personal thing. It is like asking someone if they prefer chocolate or vanilla. Personally, I love the Dijon Balsamic Barbecue sauce below. But, my hubs loves Sweet Baby Ray's Barbecue Sauce, found in your local grocery store. Also very important! Ryan wrote out specific instructions on the grilling process as this can make or break your ribs. Trust me, you don't want to spend over 2 hours slow cooking your ribs in the oven, just to ruin them on a grill! Start with a single layer of charcoal that's greyed. (I don't recommend using a gas grill because the point is getting the charcoal flavor infused into the ribs). You can also throw wood chips of hickory, cherry, or your favorite wood that have been soaked in water for 20 minutes on the coals to create a smokey flavor as they smolder. Place the greased grill on and leave for 2-3 minutes to heat up. It shouldn't be too hot. You should be able to hold your hand directly above the grill for 3 seconds. If too hot, close the vents on the top and bottom of the grill half way to allow less air flow (fires need air so less oxygen = less fire fuel). Place the ribs on the grill (halve them to make handling easier), meat side down first, leaving some space between each rib for air to circulate, cover, grill for 2-3 minutes. Open grill and flip the ribs so they are bone side down. The ribs should have some slight grill marks on them, but shouldn't be burnt. Use a basting brush to add a generous portion of sauce to the meat side that's now slightly crispy from being on the grill. Cover and grill for another 2-3 minutes. This step allows the sugars in the sauce to caramelize and create that delicious glaze rib lovers crave! Open grill and pull ribs off. 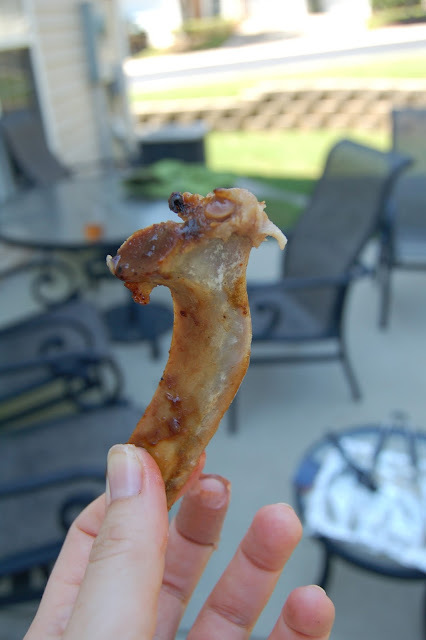 Be careful pulling the ribs off the grill because if they're tender like they should be, the bones will come right out! We don't want any rib casualties! Allow the ribs 3-5 minutes to sit under tin foil so any juices will reincorporate into the meat. 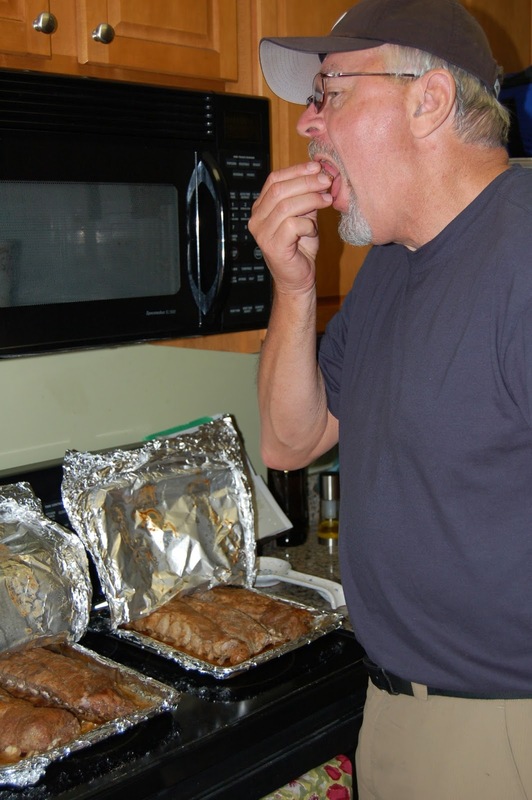 Lay the ribs on large rimmed baking sheets and cover tightly with foil. Bake in the oven for 2 to 2 1/5 hours until the meat is very tender and starting to fall away from the bones. While the meat is cooking, combine the balsamic vinegar, mustard and honey in a small bowl. This will be used as a barbecue sauce. A ready-made sauce can easily be substituted. We love Sweet Baby Rays! 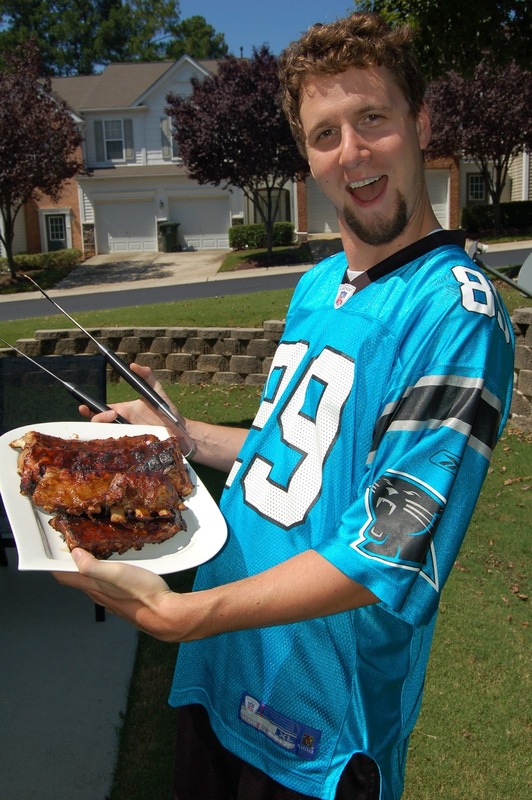 Prepare the grill, brush the sauce onto the cooked ribs and cook on the grill according to Ryan's instructions above. You should be able to pick up a rib and have the bone fall right off the meat like below! Serve right away with plenty of napkins! I picked up a half-rack by a bone and this is what happened!